Woah there Griffin! Save all this vitriol for the Bay-hate thread mate! Can we have at least one Movie topic that doesn't go off-topic into a love/hate Michael Bay debate? That's what we want though, isn't it? we want to see Prime develop as a character. we want to see how he feels and reacts. He's witnessed his family get torn apart, blown up, melted, betrayed by humans and we still expect him to do cartwheels? I don't personally object to that. As I've said before, Optimus Prime is the only Transformer who's undergone any characterisation, and it was in Age of Extinction. He went on a journey of rediscovering lost faith and hope. But it's a shame that we had to wait four movies before we ever saw any characterisation, and even then, it was frequently interrupted by other stuff. It didn't feel like the characterisation was driving the story, but rather, the story drove his characterisation. I also don't see them as a part of G1 continuity or any other, they are their own haphazard continuity with their own albeit shallow characters. That's fine, and I agree, but even if we look at Optimus Prime purely in the context of the movieverse, we can still find gross inconsistency in the first 3 movies. TF1 Optimus Prime avoided needless killing, but in ROTF and DOTM, for no reason that is apparent to the audience, Optimus Prime makes a dramatic shift in his moral principles and executes Demolishor and Sentinel Prime when they were utterly defeated and powerless to fight back. If a person did this, we would consider it to be an act of terror or a war crime. Imagine if the films were a table-top role playing game. In the first film, Optimus Prime was Lawful Good, but then in Revenge of the Fallen and Dark of the Moon, he's switched to - what may be best described as - Lawful Evil. If a player suddenly did that with his/her character, the Game Master would make him/her make a Save Roll against Insanity. Demolishor: "Whatever. I gotta go to the toilet." GM: "Optimus Prime, show me your character sheet." GM: "Because it says here that your character is Lawful Good, and you just executed a Decepticon prisoner of war." Optimus Prime: "But he was a Decepticon! He was killing people in Shanghai!" Demolishor: "Only 'cos I was trying to run away from you and your mob! I was hiding and minding my own business! Oh... hey Graham, you got any more toilet paper?" GM: <shouting.over.his.shoulder> "LOOK IN THE CABINET UNDER THE SINK!" <turning.back.to.Optimus.Prime> "It doesn't matter, Pete. At the time that you shot him, Demolishor was a defeated and helpless opponent. He was a P.O.W. and you killed him. Now make that save roll!" Optimus Prime: "That's bull-spit!" <rolls 9> "What?!" GM: "You've failed your save roll. Your alignment is now Lawful Evil, and..." <rolls.die> "...you have a phobia towards untying knots." Optimus Prime: "...oh... that's... not too bad an insanity. It's not like I'd ever end up being suspended upside down in the air by cables or something!" Shockwave: "Hey guys, I'm back with our pizza orders!" I find that funny because I play D20 RPGS. That's the main problem I was trying to point out with Bay's interpretation of the Dinobots. Just because they had beast modes it doesn't mean that they have the minds of animals. What's funny is that even if Bay let them speak would it have really made a difference? Had the Dinobots actually spoke Bay would have given them some kind of stereotypical ethnic "personality" with some throwaway lines. Whether they speak or not, in the Bay universe it's all the same to me. For the moment Transformers movies are enjoyable popcorn flicks and they will probably stay that way while they're making as much money as they have been. I would hate to see them start to take themselves too seriously and actually lose profit and stop being made as a result. as soon as the brand starts to look unprofitable, we'll start getting less of the good stuff that we do get. Terminator is about a time traveling robot. Spiderman is about a guy in a spider costume. Pirates of the Caribbean is a freaking Disneyland rollercoaster ride. I think all those movies turned out pretty well despite the source material. There's absolutely no reason why Transformers cant be the same. Especially when you have 30 years of inspiration to draw from. Why do people not get that we can have awesome action AND great characters/story? Thinking back i think it's really strange that Ken Jeong and John Malkovich characters had more personality than 95% of the transformers. Clearly more time was spent on the script for them than the TF's themselves. I love martial arts movies Jet Li, Jackie Chan etc. And Jet once said you have to create a good story with great characters otherwise the audience wont care about the fighting. And i agree - from a Jet Li movie to a giant spectacle the same principal applies. The action gets boring if you dont care about whos doing the fighting. When the 20 year old G1 cartoons have better storylines and developed characters than the movie then you know there's a problem. Grimlock: "Hey Crosshairs, none of us are called Spike." I don't think that the Transformers movies need to be super-serious or uber-deep. The Avengers and Guardians of the Galaxy films are more along the lines of what I think would work for Transformers. The stories aren't literary masterpieces by any stretch of the imagination, but they work as fun character-driven stories! We do care about the characters enough to be emotionally invested in the stories, but the stories are light enough on characterisation that it still keeps them as just fun action packed pop corn movies. And Bumblebee's inability to speak shouldn't be a hindrance to being able to develop as a character. Look at WALL·E. Both he and EVE go on epic character journeys, changing and becoming different 'people' by the film's end compared to how they began, and they barely speak! Bumblebee dumps us with loads of audio diarrhoea, and yet utterly fails to develop as a character throughout four films. They are a technologically advanced race... I'm sure there were humane methods at their disposal to put prisoners into stasis-lock or hybernation, and store their sparks until such time that they could be re-educated or re-programmed to be non-violent. Not a bad idea, but then, wouldn't that be like sensory deprivation or solitary confinement or forced reprogramming/brainwashing? People would still complain that's a very un-Optimus thing to do, even if it's better than leaving Decepticons to potentially escape and run amok. It doesn't seem like they'd have the facilities to do so, anyway, so under the circumstances, execution would probably be more pragmatic, even, dare I say, merciful. But there's the inconsistency. It's not as if Optimus Prime had been a merciless take-no-prisoners bad-bot the whole time. The first movie showed him as being more merciful, especially in the way that he was willing to sacrifice himself over Megatron. But then in ROTF he suddenly changed to become a more cold-blooded character for no apparent reason whatsoever. It'd be different if he'd been like this from the first film, but he wasn't. Part of me thinks that the change in Optimus is that he's more 'pragmatic' in that he wants to eliminate a threat quickly to minimise collateral damage in the movies following the first. His cold "we will kill them all" in DotM could be interpreted as being a product of frustration/anger that Decepticons have occupied a city, being led by his former mentor, and having been deceived into leaving the planet only to be shot down (even if they did escape beforehand); or it could have been for the benefit of Sam, Epps and the other humans trying to infiltrate Chicago. His anger in AoE is pretty reasonable, in my opinion, since after fighting with humans to protect them for so long, they turned on them for seemingly no reason at all. I also wonder if Optimus's change to being more ruthless was partly audience-driven - as I recall, people didn't like the fact that Optimus was being tossed around so easily by Megatron in the first movie, so maybe the change was a way of addressing that, to make him seem more formidable. Given that consistency and coherence have been largely irrelevant to the franchise so far, it's hard to see why a reboot would be neccessary. Just take whatever is working, make another movie and call it "TF5: Age of Galvatron". No need to throw the baby-bot out with the cyber-bathwater. There's good stuff here to build on. In fact, it would be nice to see them develop things rather than scrapping everything and starting over. How many characters and TF models have they gone to the effort of creating only to have them stand around in the background or do one scene before they're killed-off or never seen again? Jolt, Que, Mirage... Jazz? Even Ratchet didn't really get a decent spotlight until his demise in TF4. Megatron looked so cool in DoTM so it felt like he was under-utilized with almost all of his scenes just being him standing around being grumpy before getting his spine immediately ripped out as soon as he decides to get involved in the action. Shockwave? Now that was an anti-climax. We get a cool two-headed version of him in TF4 apparently only to further taunt us. I agree with Yongeltron. A reboot would be a cop out IMO. And as he said, it wouldn't really matter if a few things became inconsistent anyway. I don't think things are too inconsistent between movies (ok, you have to do a fair bit of mental gymnastics to put things together), but I don't think there are elements in the movies that outright contradict each other. That said, I agree with the rest of your comment - why is a reboot necessary? Reboot seems to have been the buzzword in cinema in the last decade (one of them, anyway, along with 'dark' and 'gritty'), and is in my opinion, a cheap, easy, even lazy way out. Surely a better test of writing prowess would be the ability to work with what you have? I still enjoy watching the movies and often watch them when they are on TV, so I'm not one who finds things to complain about them or him, but I'd enjoy them a lot more if I could ignore the plot errors, embrace the characters and love to be inspired by the pure hero that "Optimus" has always been in the past. After all, if you can't trust your heroes, who is left to inspire you. I thought that a 'trend' these days was to see the flawed/fallible/not-entirely-trustworthy/morally ambiguous heroes, but I see what you're getting at. What I'd actually like to see is for it to be scaled-down a bit. Focus on the core premise from the first movie of these strange mechanical alien beings existing among us as everyday vehicles, hiding in plain sight, robots... in disguise...if you will. Focus on a small cast of autobots (three or four) that we can actually get to know and a couple of humans who we don't hate. Decepticons are menacing hunters that are lurking nearby, killing with purpose and stealth. Rather than huge big pitched battles alongside the US military, have the bots face off in more personal battles. A decepticon attacks, so the guardians are scrambling to protect their fleshy friends. Show off their individual capabilities and personalities in desperate, scrappy personal fights with their malevolent counterparts. Let us get to know the villains a bit too, so there's actually some motivation to their conflict. If we are focused on characters that we actually get to know, then we're more invested in their conflict, so the action is more engaging without having to resort to grand-scale battles. Make more of the fact that these are aliens with an existence quite unlike our own, yet still like us in important ways. Give us characters we can connect with, transformations where we can understand what we're looking at and a story that actually says something. That's not too much to ask for, is it? Also, no more swirly KSI parts-forming. That was ridiculous. The scaling back/back to basics idea is an interesting one. I think there is an unspoken 'need' for sequels in general to go bigger/higher stakes. Perhaps there may be a perception that unless you do that, you become kind of repetitive. The big, complex transformations showcase the fact that these are complex mechanical 'lifeforms'; it also allows for mobility in robot mode; how many times did we see joint 'cheating' or supposedly solid parts warping out of shape for a character to move in G1 or Beast Wars? The KSI transformations were, I think an attempt to try something 'new' with transformations. They also add a weird dimension to Galvatron and the drones, in that you can't see where one part ends and another begins when they transform. I will admit, though, it's more 'satisfying' to see parts fold and rotate during a transformation. Prime does ask for their help first though "so, today you stand with us, or you stand against me." I've got nothing to back this up, but I thought it was possible the Dinobots went crazy/were barely stable/controlled from being locked up in the ship for who knows how long. Brains alludes to it when he implies he went crazy as a result of being forced to comply with Joyce and the KSI staff. But they did fix his voicebox... but Bay preferred the mute bot element of talking through his radio. So it was just one of the many retcons or contradictions in his four movies. Was that really Michael Bay's decision, or the writers? I thought Orci and Kurtzman wanted to run with the relationship that 'went beyond words' or something like that. That's the main problem I was trying to point out with Bay's interpretation of the Dinobots. Just because they had beast modes it doesn't mean that they have the minds of animals. You could argue that's pretty G1 cartoon-accurate which is what a lot of older fans are using as their mental reference point, although you did refer to the other characterisations of the Dinobots. It was just another of Bay's lazy 2-dimensional stereotypes... like his racial stereotypes of many of his other characters (like Skids, Mudflap, Shane, Leo, most of the Asians in TF4, Figueroa, Drift, etc, etc, etc). I agree that having characters act in a certain way (which may or may not involve racial characteristics/stereotypes) can be a sort of 'shortcut' for the audience to understand how a character thinks, but this is not always meant to be negative. In this case, it just seems like an excuse to show Michael Bay in a negative light. After all, this is the guy who had two black men as his protagonists in his debut movie, and again in the sequel. I remember reading about Skids and Mudflap when RotF first came out. I was curious and wanted to see what the fuss was all about. When I did, I thought, "That's it? That's what everyone was making such a big deal about?" It seemed like making a mountain out of a molehill, and I was more inclined to agree with the idea that the twins were a parody of teenagers trying to act 'gangsta' than a negative 'black' stereotype. I certainly didn't get any racist vibes out of any of the humans' portrayals, or even Drift or 'the Doctor'. Why couldn't it have just been a charge of the heroes with the Dinobots being willing comrades to their fellow Autobots... and how does the ground explode when Grimlock's weapon hits it? It's like Bay tries to find a way to include explosions in every scene, even if it means re-writing the plot or characters to achieve it. Why couldn't it be some sort of invisible energy wave that Grimlock's weapon transmits whenever it hits something? - Someone important that isn't evil must die or be believed to be dead (the tragic element). - The hero(es) must become targets or hunted as if they are the villains (to get sympathy from the audience to hope they regain their hero status). - The main hero must do something that creates doubt or mistrust by others and the main villain needs to show themselves as justified in their actions (to have shades of grey to every character, so that there isn't any black or white heroes and villains). - There must be a romance, but is difficult for the guy to get the girl. - Something needs to be found. - The villains should be defeated, but not entirely if there is potential for a sequel. It would be less cliched if modern action movies could actually avoid conforming to those requirements just to appease the reviewers and critics that could make or break them. This is a good point. As I understand it, and I am certainly no student of literature, stories throughout history follow the same basic ideas, but still, for a movie, breaking the mould story-wise can be pretty risky, especially when millions of dollars of studios' money is on the line. Again, this is a writing issue, not a directing one. That comic strip is simply awesome. but if any one of those plans worked the others no longer mattered. Point of contention, I didn't think Bumblebees voice was fixed, it was worked on at the end of the first movie but it was still patchy and I didn't think he used it to even form a full sentence. as such, for Ratchets field patchwork to not hold isn't much of a stretch. Primes progression to angry killer in the movies hasn't seemed all that far fetched to me either. We are used to prime being extremely noble, but after millions of years of war, which has to be wearing, they are all on a planet that Optimus feels compelled to protect and at every turn the Decepticons are killing and maiming humans. In the third movie, the humans are even working with the Decepticons, such a low blow after all the sacrifices Prime and his team have made. And they've been keeping secrets from him. We don't know between movie 1 and 2 just how many people the decepticons have killed, perhaps the termination of Demolisher is simply carrying out a judgement. Sentinel Prime was their hope, his mentor of millions of years, the one who instilled his values and he has turned on it all killing humans and Autobots and trying to kill prime, he had it coming. Prime even gave him the opportunity in Washington to change his mind, and it nearly cost him his life. It's not like he just walked up to him and killed him in cold blood. by AOE Prime has discovered that Humans have turned against him and his people, for all the help and sacrifices they've made. I'd be pissed too. "I wish to stay with the boy." ^Two fully complete sentences at the end of TF1. But that's just the thing, the films don't really provide exposition to tell the audience why Optimus Prime has suddenly changed his character alignment. The audience shouldn't need to have to invent reasons as to why the character has suddenly changed -- that's just poor story telling. Even the clunky Star Wars prequels provided Anakin Skywalker with a visible progression towards becoming Darth Vader. It wasn't great, but it mostly worked. Optimus Prime is a seasoned veteran; he's been fighting this war for millenia and witnessed "whole generations lost" back on Cybertron. The films portray their war on Cybertron as being far more savage than that on Earth. The war on Cybertron destroyed their world (hence the Decepticons' plan to restore Cybertron with the Solar Harvester or the Space Bridge/human slaves). Optimus Prime was determined not to let the humans suffer for their mistakes and have history repeat itself on Earth. So while the continuing casualties would have been tragic, it's hardly anything that he's unused to. Optimus Primal had a moment of despair, but he is explicitly shown as mentally snapping after losing Tigerhawk... and even then, he was able to quickly pull himself together and get on with the job of attempting to win the Beast Wars. Because, as Spock would point out, a commanding officer who is emotionally compromised is no longer fit to command. If Optimus Prime cannot contain his anger to the point that he's executing P.O.W.s and even threatening to kill humans (rather than bringing them to justice), then his ability to command is in question. Only bad guys are shown as continuing to command in anger/hate -- good guys are supposed to be above that. That's what's supposed to separate the good guys from the bad guys. Without this moral divide, then what makes Optimus Prime any better than say Lockdown? Lockdown doesn't actually hold any personal animosity towards anyone. He's a mercenary much like Boba Fett or James Bond (or Han Solo in his initial appearance). He doesn't personally like or dislike Optimus Prime and the Autobots, he's just doing his job. Lockdown doesn't get emotionally compromised because he doesn't allow himself to become emotionally invested in his mission. This is the Optimus Prime that we saw in the first movie. Noble and determined to hold the moral high ground (even if it meant sacrificing himself over Megatron). When Ironhide momentarily lamented, it was Optimus Prime who stood his ground and reaffirmed the Autobots' ethos. Ironhide: "Why are we fighting to save the humans? They're a primitive and violent race." Optimus Prime: "Were we so different? They're a young species. They have much to learn. But I've seen goodness in them. Freedom is the right of all sentient beings. You all know there's only one way to end this war: we must destroy the Cube. If all else fails, I will unite it with the spark in my chest." Ratchet: "That's suicide! The Cube is raw power, it could destroy you both! Optimus Prime: A necessary sacrifice to bring peace to this planet. We cannot let the humans pay for our mistakes. It's been an honour serving with you all." 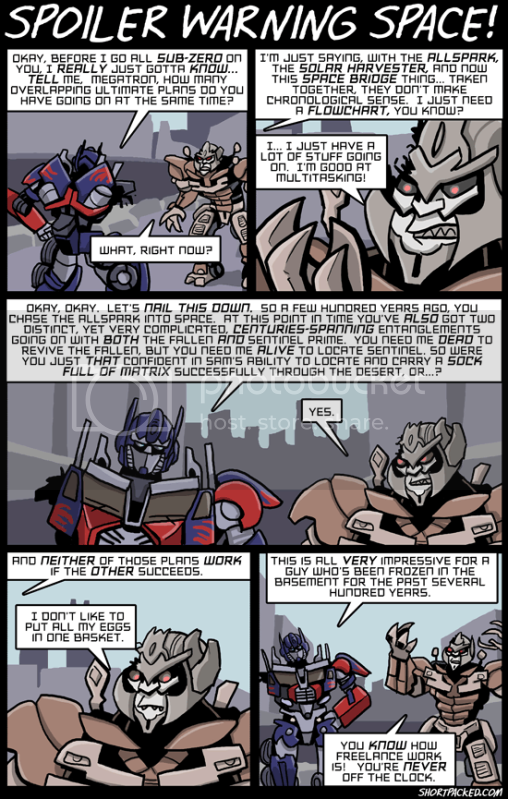 Okay, Optimus Prime felt betrayed by Sentinel Prime and the humans, but remember that he was betrayed by Megatron too. When Optimus Prime removes the AllSpark sliver from Megatron's corpse, he regrettably says, "You left me no choice, brother." How did Optimus Prime devolve from this benevolent character to becoming who he was in the sequels? Okay, we could sit here and postulate plausible reasons, but we shouldn't have to. The movies themselves should provide us with a reason. In the absence of a presented reason, I'd be making Optimus Prime roll that 1D20!